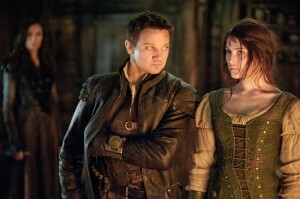 Left to right: Famke Janssen plays Muriel, Gemma Arterton plays Gretel, and Jeremy Renner plays Hansel in “HANSEL & GRETEL WITCH HUNTERS.” ©Paramount Pictures. CR: David Appleby. “Hansel & Gretel: Witch Hunters” fractures the classic fairy tale by aging the children into adult action heroes who have a lot of attitude and a cartload of fantasy firearms. The movie has its moments, but disappoints by not taking itself seriously enough to be very involving while not having enough consistent laughs to come off as a satisfying goof. Writer/director Tommy Wirkola (“Dead Snow”) should have gone full medieval or wall-to-wall slapstick, instead of relying on tongue-in-cheekiness that often falls flat. The premise of turning the saved-from-the-oven siblings into vengeance-seeking vigilantes dates back at least to 2006, when the Vertigo Comics series “Fables” made Hansel a relentless witch killer who thought the Salem trials were a swell idea. 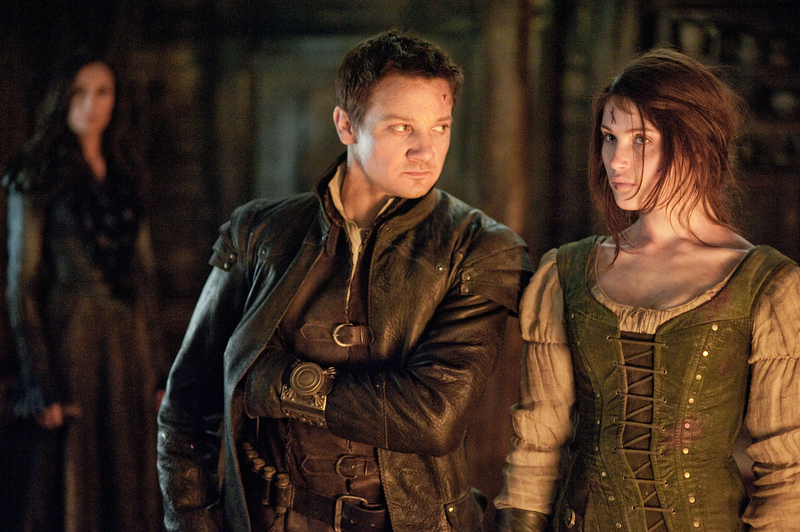 In “Hansel & Gretel: Witch Hunters,” Gretel (Gemma Arterton) also gets in on the action, wielding a machine-gun style crossbow alongside a very trigger-happy Hansel (Jeremy Renner). A clever bit of characterization involves Hansel needing regular injections for the “sugar sickness,” because he ate so much candy in his youth. The screenplay goes for a “Hellboy”-style semi-sarcastic self-consciousness that never quite succeeds. Contemporary-sounding characters don’t seem especially worried about coming to harm even in very life-threatening situations, and are prone to making ironic asides of the “you’ve got to be f***ing kidding me” variety. Arterton is simultaneously beautiful and tomboyish in a bodice and skin-tight leather pants. You just know from frame one that she’s going to end up bound to a rock and in need of rescue, but until then she gives a good account of herself in various high-risk confrontations. One complaint is that Gretel is forced to suffer far too many fist-punches to the face over the course of the film. After awhile, that kind of kisser-bloodying mayhem starts looking a little too much like misogyny. The town’s nasty sheriff (Peter Stormare), prevented by the cockily confident duo from executing a suspect (Pihla Viitala), resents them enough to sabotage their later efforts. The era’s equivalent of a hero-worshipping fanboy (Thomas Mann), who keeps a scrapbook of H&G’s exploits, joins them to hunt down a particularly vicious witch (Famke Janssen). The movie’s best character has the fewest lines of dialog and very little screen time: A huge, homely and endearingly pathetic troll named Edward (Derek Mears), whose expressive face is a makeup marvel. A reluctant servant of witches, Edward develops a King Kong-like affection for Gretel when he sees her being attacked. Most of the film’s action scenes are too fast-motion frantic to follow, a situation that’s not helped by the movie’s aggravatingly dark 3D. Also, director Wirkola seems strangely reluctant about lingering over the hardware in Hansel and Gretel’s eye-popping arsenal. Although a nifty fold-open rifle is employed in one scene, we don’t get a really good look at the thing until it shows up later in the closing credits. A few too many “f” words and a little red-meat gore apparently earned the film an “R” rating that seems undeserved, because “Hansel & Gretel: Witch Hunters” ultimately plays more like a slightly edgy Disney flick than a foul-mouthed Tarantino bloodbath.